‘Nufa Gukuru’ to honor legendary artist Yuko Majikina. On Sunday, Nov. 2, the Los Angeles-based Majikina Honryu-Aigen no Kai dance company will present “Nufa Gukuru — My Spirit Dances” at the Aratani Theatre in Little Tokyo, led by artistic director Aiko Majikina. The show pays homage to the late founding grandmaster of Majikina Honryu,Yuko Majikina. Considered a giant in the Okinawan performing arts, Majikina is arguably one of the most influential artists of the traditional Okinawan performing arts in the 20th century. In 1972, he was designated a “Perpetuator of the National Treasure of Kumiudui” by the Japanese government. Kumiudui is a genre of traditional Okinawan theater created in the early 1700s for the royal court of the Ryukyu Kingdom, as Okinawa was formerly known. This form of theater was recently inscribed on the UNESCO Representative List of Intangible Cultural Heritage of Humanity (2010). In kumiudui, the musicians and dancers share the stage as the actors intone their lines with a distinct lilt as the music and lyrics narrate the story. As is tradition, the script and lyrics are all in the Okinawan language, known as Uchinaaguchi. The highlight of the program will be the premiere of “Chindera nu Turaju,” a musical drama that makes its premiere in the mainland United States. The play will be accompanied by English subtitles. As an artist, Majikina was also known for his memorable and creative dance choreographies, as well as his Okinawan poetry and lyrics. “Nufa Gukuru” comes from one of his poems, which describes the importance of dancing not for vanity and glory of stage performance, but rather to emphasize the spirit and the art itself. Aiko Majikina began dancing at the age of five in Okinawa, after her grandfather had taken her to see a show put on by Yuko Majikina and his family. World War II halted performing arts activity in Okinawa, but Majikina would tour the island in an effort to help lift the spirits of the Okinawan people by performing in a traveling “minstrel” troupe with his young family. It was during this post-war period that Aiko Majikina was first exposed to the grandmaster and his daughters, Yoshino and Yoshinae, the current grandmasters. Years later, after she moved to Los Angeles, she would receive training from all three. 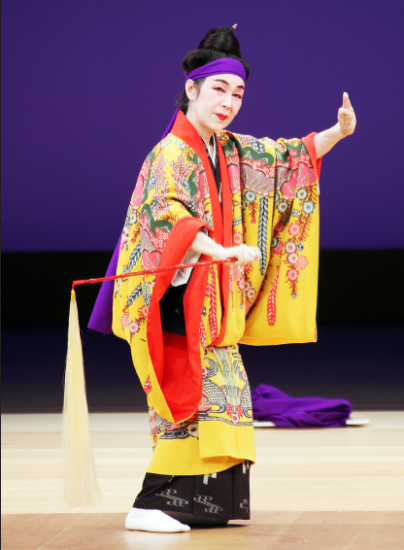 In addition to providing a rare glimpse of the traditional art of kumiudui, the program will also showcase Yuko Majikina’s choreographies, including some of his most iconic dance numbers, known particularly for capturing the essence of Okinawan people and their lives. One of the dances being showcased is “Watanja” (debuted circa 1958), a lively and humorous depiction of a typical group of boat passengers of the Watanji district in the capital of Naha. Another dance is “Itoman Otome” (1955), embodying the strong spirit of the entrepreneurial women of the southern district of Itoman who buy their fishermen husbands’ daily catch and run to Naha to sell the fish before it spoils. The unique way in which the women would run the route to Naha is something to watch for. Majikina Honryu-Aigen no Kai will also be joined by dancers and musicians from Okinawa, as well as musicians from Hawaii. The show is supported by the Okinawa Association of America Inc. (OAA). The show begins at 2 p.m. The Aratani Theatre is located at 244 S. San Pedro St. in Little Tokyo. Tickets for reserved orchestra seating are $30; general balcony seating is $20. Cost at the door: $35 and $25. To purchase tickets, leave a message at (310) 532-8772 or email [email protected] Tickets can also be purchased through the OAA office at (310) 532-1929 or ordered on the Majikina Honryu Los Angeles Facebook page and website: www.MajikinaHonryuLA.com.